One of the best ways that you can stimulate your dog’s brain and help them live long and happy lives is by getting them interactive dog toys. No matter what breed you have from Golden Retrievers to French Bulldogs, from Rottweilers to Yorkshire Terriers and everything in between, interactive dog toys are widely loved by just about every dog out there. Giving them a toy that is going to play with them as much as they play with it can be one of the highlights of dog ownership, and all you have to decide is what kind of dog toy to give them. We will be looking at interactive dog toys closely in this buying guide as well as reviewing some of the top toys out there. These are some of the top interactive dog toys currently on the market. Any of these five should work for your dog, as they are made for a wide variety of breeds that include Boxers, Siberian Huskies, Great Danes, Poodles, Beagles, Doberman Pinschers and more. Interactive dog toys like automatic fetch machines or puzzles are really popular with dogs, and any of these five toys are sure to make your dog happy. Should Your Toy Make Noise? The first toy is from Allstar Innovations and it is one of the most innovative ideas out there when it comes to interactive toys that your pet can play with. The Wobble Wag Giggle Ball is truly a remarkable design, as it makes all kinds of neat sounds and noises to engage your dog without any batteries or electronics whatsoever. This ball uses forced air through tubes inside of the ball to make all sorts of sounds that your dog will love. Whenever they move it with their nose or try to grab it with their teeth it will start making sounds and will continue making them the entire time that they are playing with the ball. This is truly an interactive toy, as it makes really engaging noises so that your dog wants to play with it, similar to the sounds that humans make when playing with the dog. 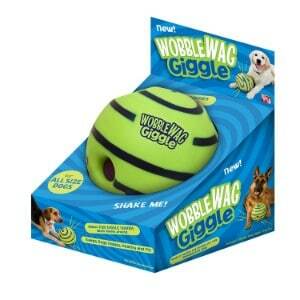 These pleasure sounds make your dog want to keep playing with the Wobble Wag Giggle Ball, and there are number of features that make this one of the best interactive toys on the market. If you have a dog that has a tendency to tear stuff up, and you have to go with indestructible dog beds and reinforce dog bowl or automatic dog feeder, then you will be glad to know that this is one of the most durable toys on the market right now. You will be able to give this to your pet that is rough on toys and still expected to last many months or years. In addition, this is the perfect toy for any size dog because of the way it is designed. With the little pockets lining the toy, any dog with any size mouth can get their teeth into this interactive plaything, and when they get attached to it and shake it, it gives off a completely different sound to reward your dog for having been able to pick it up. This will stimulate your dog both intellectually and physically, keeping them from becoming anxious and tearing up things around your house while you are not home. Outward Hound makes this plush hide-a-squirrel toy, and it is really terrific toys for dogs because it has rewards for them already built in. 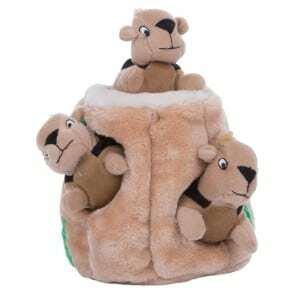 This is a plush toy that consists of three squirrels inside a tree trunk. The thing is, your dog has to work pretty hard to get the squirrels out of the tree trunk. Once they are able to ferret out all three using their nose and paws, they will feel a sense of accomplishment that they might not get with other interactive dog toys on the market. There are dog toys that move, dog toys that make noise, and other types of dog toys, but this is even better because it is one of the most challenging dog toys out there and is definitely in the category of toys to keep dogs busy. The way that this game works is by you putting the squirrels inside of the tree trunk and then introducing your dog to it. They will be able to learn very quickly that there is something inside of the toy, and will begin right away trying to fish out the squirrels inside the tree trunk with their teeth, nose or any other body part they can use. The thing is, these are extremely durable plush toys, so even if your dog chews at them with their teeth, they are going to last for a long time. The squirrels are perfect for any size dog, because even smaller dogs can get their mouths around the arms and legs of the squirrel. Another advantage that this toy has over some of the others on this list is that it doesn’t require batteries, and it squeaks a little, but isn’t going to make a lot of noise that might distract you if you are working on the computer or trying to watch television. This is a toy that your dog is going to play with over and over again, because there is nothing quite like the satisfaction of pulling the three squirrels out of the tree trunk. Just like the computer games that you play over and over because you like the challenge, dogs are going to love the challenge of playing with this toy and completing the puzzle. 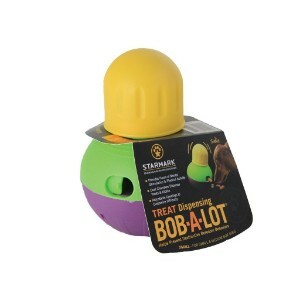 From StarMark, this interactive Bob-a-Lot dog toy is one of the best designed toys out there for dogs, preventing separation anxiety while you are away and giving them hours of pleasure. That’s because it dispenses dog treats as a reward for your dog playing with it. The way it works is, you put in the dog treats and then put the unit back together, and then simply lay it on the ground for your dog to play with. Once they realize that the machine will dispense treats if they play with it, dogs will become obsessed and spend hours batting the machine all over the room until it dispenses a dog treat. There is a lot of room inside the machine for treats, so your dog is sure to get several hours of fun before you ever have to fill it up again. This machine also has a few advantages that you don’t even find among the other toys that are listed here. For one thing, you are able to set the difficulty level. You can make it extremely difficult for your dog to get a treat out, or you can make it so easy that they will be able to get treats by just playing with it for a few seconds. It comes in three different sizes and is perfect for just about every dog breed out there. It is also extremely easy to use, so if your dog is older or has a disability where they need to use a dog ramp to get around or cannot play with the other toys listed here, this one is going to be very simple and easy for them to use. The bottom line is that when it comes to treat dispensing dog toys, you are not going to find a much better option than this one, especially if you are not trying to break the bank. There are lots of accessories that you can get for your dog such as cooling pads for dogs, cooling vest for dogs, both for summer time use, or location tracking and activity monitoring such as a GPS tracker for dogs or dog activity monitors. But with those useful accessories, give your dog something to do while you are gone with this interactive dog toy. If you want your dog to work for a treat, then this West Paw Zogoflex toy is another great interactive dog toy that dispenses them. This machine is not as comprehensive or challenging as the previous one, but it does have the advantage of three rounded edges that make it more difficult for your dog to grab onto it. This is something that your dog will be putting in their mouth a lot, and luckily, that is exactly what the manufactures intended. It dispenses treats from the middle, but it is extremely durable and intended last you for a very long time. This interactive dog toy comes in three different colors, and it is destruction-proof and waterproof, so you can pretty much put it anywhere that your dog hangs out including inside their dog crate, on their dog bed, in their dog playpen or dog house or outdoors in their outdoor dog kennel. You don’t have to worry about it raining, so they can take it out of your electronic dog door and leave it outside if you want. Giving your dog a toy that dispenses treats is one of the best ways that you can save your furniture from being torn up or your shoes from being chewed. This is one of the best interactive puppy toys as well, because younger dogs tend to need simpler puzzles and interactivity in order to use the toy successfully. You still want to reward them with treats, but you don’t want to make things too complicated; that’s why this is such a good toy for younger dogs. If you need something to keep your dog busy, this is one of the best options on the market right now. 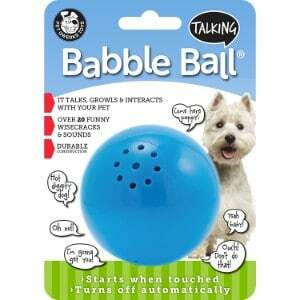 This talking Babble Ball toy from Pet Qwerks is an interactive dog toys that works on batteries and will keep your dog entertained for hours because it makes humanlike speech sounds, causing your dog to continually interact with it. 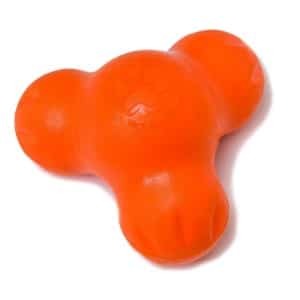 This is a ball that your dog plays with, which makes it difficult for him to get his teeth around, making it a challenging toy that will keep him or her interested, all the while making noises and human words. Since dogs think that this dog toy is alive, they will continue to play with it long after they would have given up with other types of toys or balls. The battery life is long-lasting, and the toy is extremely durable, lasting for months or years longer than you think it would. This toy talks, growls and interacts with your pet, making humanlike sounds with more than 20 different funny and wisecracking sounds that your dog will recognize and learn to love playing with. For example, this interactive dog toy will say things like “come here puppy” and “I am going to get you.” This interactive ball plays with your dog in the very same way that you would play with your dog. Another terrific feature about this ball is that it shuts off automatically when your dog is tired of using it, and it will turn itself back on the minute your dog starts playing with it again. That saves you a great deal on battery life as well. This toy also comes in three different sizes. There is small, medium and large with the small balls being perfect for even the tiniest breeds of dogs, and the large size appropriate for big breeds like Great Danes. There are a number of factors that you need to consider when it comes to buying an interactive dog toys. In order to get the right toy for your particular dog, you need to know what those factors are and what to look for when you’re buying one. Many people only look at a limited number of factors such as price and availability when buying toys and accessories for their dog, but when it comes to an interactive dog toys, you need to take your time and really look at everything before you buy. You want an interactive dog toy that is going to keep your dog entertained for hours. This is fairly easy to do. Any toy that you get that is new is going to keep your dog entertained for a few hours. But what you actually want is to keep your dog entertained for hours over and over again. That means choosing the right dog toy to begin with. Helping you choose the right dog toy is exactly what we are going to be doing in this buying guide. You will be looking at factors like the size of your dog, the breed, the level of difficulty with the interactive toy and what kind of material it is made out of; among other things. This buying guide should give you a solid foundation upon which to choose your next interactive dog toy. You do want to choose the right dog toy for your specific breed. That means that you’re going to have to do some research on your breed. Some breeds do really well with complex puzzles, while others get frustrated easily. Some breeds should only be given interactive dog toys that have simple puzzles because otherwise they are not going to take time to play with it. It will all depend upon your dog’s natural curiosity, whether the toy is appropriate for that particular breed of dog, and the personality of your dog in particular. These are a lot of different considerations, but the best way to find out if a toy will work for your particular breed of dog is to read the customer reviews of the product that you are considering. Most people that post reviews will say what kind of dog they have. If you find that there is a pattern, either positive or negative, for a particular breed, then you will have a great deal more information to make a buying decision. Some dog toys just work better with some breeds, and the only way that you will be able to find that out is by doing the research. The size of your dog is also something that you need to consider when you are looking at interactive dog toys. There are a lot of dog toys out there, and some of them come in various sizes to fit different breeds, ages and sizes of dogs, but you still need to be aware of a few things. First of all, when it comes to size, what you really want to be concerned with is how your dog is going to be interacting with the toy. For example, are they going to be biting it with their teeth, holding it in their jaws or just playing with it with their nose and paws. If it is the former two, then you need to be aware of how the toy fits into the dog’s mouth. If a toy is too big for your dog to play with then it is totally wasted money. If you buy a toy that is meant to be bitten and chewed, but your dog’s mouth is too small to do either of those, then you aren’t going to get any benefit from the toy. On the other hand, if you get a toy that is too small and you have a large dog, then they aren’t going to want to play with it very much either. The difficulty level that you choose for your toy is another factor to consider. You want to go by your dog’s personality and brainpower on this one. There are various levels that interactive and puzzle dog toys are loosely categorized under – level one, level two and level three. Each of these is a little bit different, and you will have to determine for yourself which level fits your dog the best. Let’s look at each of these levels in detail. Level 1: The first level is the easy level. Level 1 is the level that you should start any pet out when they have no experience playing with the toys. This is the same whether you are choosing an interactive dog toy, or if you are setting the level of an adjustable dog toy. Level one is perfect for dogs who are just starting out, or for dogs that do not have a lot of patience with these types of toys. Level 2: The second level is a little more complex. This is the intermediate level, and it is for dogs that have some experience with a puzzle toy or an interactive dog toy. This level requires that dogs complete at least two actions (and usually not more than two) in order to get the treat or the dog food from the device. Of course, not every dog toy uses treats or food, but whatever the reward is, it will take two actions to get it. Level 3: The third level is the advanced level, and it requires that your dog complete a series of challenges in order to get the reward, dog food or treat from the interactive dog toy. This is usually at least three steps, but it can be as many as four or five steps as well. This is for advanced dogs that really like a challenge and do not give up easily. The reward should also be worth the work involved. There are three basic materials that make up the dog toys that are now on the market. The material isn’t really that important, but it is something to consider, because the material can help to determine things like durability, playability and cost. Let’s look at the various materials that you have to choose from for dog puzzle toy materials. Plastic: The first is basic plastic. This is one of the most common materials out there for making interactive dog toys. Plastic is extremely durable and lasts for a long time – especially if it is not used that often – so your dog toy should last for many years. Plastic is probably the most common material that these types of dog toys are made out of, and the reason is simple – they last longer than other types of materials. Rubber: Some toys are made of rubber though, and you want to be aware of these rubber toys when you come across them. For example, if you have an interactive dog toy that bounces or is easily gripped by your dog such as a tennis ball, then it is probably because it is made of rubber. Rubber is not as common as plastic when it comes to interactive dog toys, but there are some toys that are made of rubber and you should be able to recognize them when you see them. Plush: Plush toys are also available when it comes to buying the best interactive toys for your dog. In fact, one of the toys that we reviewed in this buying guide – the squirrels inside of the tree trunk – were plush toys. Plush toys are not as common as some of the other materials listed here, but they are definitely one of the options available. You will have to decide what material you prefer as you are shopping for dog toys. Whether your toy makes noise or not, or whether it uses various lighting features in order to engage your dog, are things that you want to consider before buying a dog toy. First of all, there are plenty of interactive dog toys on the market that make noise. Whether you want to go with one of them is up to you, but just be aware that they are more interactive for your dog. If your dog toy makes noise, then there is a greater chance that your dog is going to play with it. However, you have to balance that against whether or not you are going to be able to concentrate with the noise that your dog toy is making. If your dog toy is squeaking and making lots of noise, then you may not be able to concentrate on whatever you are working with on your computer or even watching television. You will have to determine for yourself whether or not that is the case, and decide if you want a toy that makes noise or not. Most of the time, toys that make noise are better for your dog, but they may not be better for your particular lifestyle. Motivating your dog with treats is a common tactic of interactive dog toys. When you present a puzzle toy for your dog, one of the biggest rewards that you can give them is a dog treat when they finally complete the puzzle. However, this does not necessarily mean that you are going to be able to continue to motivate them with the same dog treats. If it takes your dog a great deal of work to get one dog treat out, then they’re probably going to stop playing with the device. You have to find a balance between what your dog is willing to do for the right treats, and how much work is involved in getting the treat out when it comes to your particular puzzle game. There are a lot of interactive dog games on the market these days. Some of them allow you to add dog food or dog treats directly to the device. That means that when your dog starts playing with the device, the dog treat or dog food is able to be shaken out. However, the amount of food that comes out, or the number of treats that come out, is totally dependent upon you, based upon your selection of the exact dog toy and the difficulty level the set. There are a number of factors the want to keep in mind when it comes to interactive dog toys. These are additional factors that will help you determine whether or not an interactive dog toy is the right choice for your dog. These are some of the same things that you may have already considered when you were looking at dog toys, but here they are presented in a more comprehensive fashion with better detailed information that helps you decide whether or not that factor is an important consideration. Engaging: The toy should definitely be engaging. You want your dog toy to attract the attention of your dog. You want them to be interested in interacting with the toy. If not, then it doesn’t really matter what rewards are built into it, you are going to have no success with getting them to play with the toy. However, dog toy that present them with the rewards they will like in a timely fashion, then you will have a winning design. Durable: You absolutely need your dog toy to be durable. You want your dog toy to last for many months or years to come. You want them to be able to play with your toy, but not be able to tear it up right away. That’s not necessarily because dog toys are expensive – because they are usually not very expensive at all – but it is because you want to give them as much enjoyment out of a particular toy that you as possible. Safe: You also want your dog try to be safe. This is definitely something to keep in mind, because when you choose a dog toy that is safe, you know that your dog is going to be able to play with it without experiencing any serious health issues or death. Giving your dog toys with choking hazards or other health risks is a major issue and you will want to keep that in mind. Personally Appealing: Finally, you need to make sure that an interactive dog toy is going to be personally appealing to your dog; you alone know your dog’s personality; you know what dog toys are going to be appealing to them and which are not. ; if you choose the right one, then you are going to spark interest in them and make them play with the dog toy right away. There are definitely some terrific features of the best interactive dog toys out there that you should be aware of. First, make sure that your dog toy encourages socialization. Your dog toy should encourage your dog to interact with other people, after using the toy, even if they are not interacting with an actual person while they are playing with it. The second thing that it should do is provide an expenditure of physical energy. You want your dog to get tired while they are using the toys. That means that they are not going to tear up other things in your house. Speaking of which, that is the next factor that you want to consider – whether or not your dog is going to destroy items in your home if they have this dog toy to play with. Most of the time, dogs will choose the dog toy over other items in your home. But if your dog is still tearing up rolls of toilet paper, or chewing your shoes, then you may want to choose a different dog toy or adjust the one that you have so that they are willing to play with it. Your dog toy should also alleviate separation anxiety and make sure that your dog is not bored while you are gone. It should also improve their dental health and make sure their jaw muscles are working properly. One thing that you can do to make sure that your dog is using your interactive dog toys properly is to change it out regularly. Whenever dogs are presented with a new challenge, they are going to try to complete it, and that’s exactly what interactive dog toys are giong to provide. Make sure that you change out your dog toys often enough to give them something new to concentrate on. The bottom line is that there are lots of things that you need to keep in mind if you want to get an interactive dog toy for your dog. You need the best out there, and there are a lot of options on the market these days. When it comes to choosing the right interactive dog toy, you want to provide reasons for your choice, and that’s exactly what this document provides you with. There are a lot of things to consider, but there are a lot of things to be skeptical about as well.